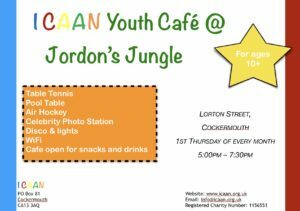 I CAAN Youth Café at Jordan’s Jungle. First Thursday of every month 5:00pm – 7:30pm. Café open for snacks and drinks. Table tennis, pool table, air hockey, disco and lights and free wi-fi.